In this highly anticipated collection, Unitarian Universalist Humanists present their faith perspectives in 23 engaging and thought-provoking essays. The contributors, both lay and ordained, demonstrate why Humanism has been one of the bedrock theologies of Unitarian Universalism for the last hundred years. They reflect on what it means to be a religious Humanist today and how they see the movement evolving in the twenty-first century. They explore Humanist history, beliefs, approach to life, social justice, community, and religious education. Together, these voices proclaim a passionate affirmation of a rich and dynamic tradition within Unitarian Universalism. In the end, Humanism is not a faith for the mindless, the heartless, those without integrity, or those who are merely cynical in their skepticism. It is not a feather bed for the spiritually lazy who want to believe and do as little as possible with their all-too-brief, mortal lives. Humanism encourages those of us who embrace it to live as fully as we can, in all the authentic wonder and curiosity that the human spirit can generate. It summons us to a persistent obedience to evidence and reason, to recognize in our deepest and most beautiful longings not the world that is, but the world that might be, if we, by our courage, intelligence, and dedication, will make it so. Yes, we are broken, but my Humanism says, so what? I am often broken, yet pieced together. Sometimes the duct tape and glue of our healing process holds us together. Sometimes another’s love has transformed my hurt so thoroughly that there remains only the remnants of a once-raw scar. The point is, when we can just sink into this, we can be less lonely, less afraid, less disconnected. Together, in the company and love of one another, we can be made whole. This is my Humanism. Not singularly intellectual. Not steeped in certitude. But a relentlessly relational, ruthlessly real, test-driven-by-near-death Humanism. Humanism of holy stardust and ash. Of brokenness and wholeness. Savor diverse perspectives within Unitarian Universalist Humanism, articulate and heartfelt. They help explain distinguishing features of our free faith, which have meant so much to so many of us Unitarian Universalists for so long: heeding the guidance of reason and the results of science, while steering clear of idolatries of the mind and spirit. These pages are full of generosity, reaching across our pluralism to provide broader definitions of theological concepts than many might have thought possible within Humanism, including mysticism, reverence, transcendence, wonder, mystery, awe, religion, the holy, and the sacred. All Unitarian Universalists should be proud of and inspired by our Humanist heritage, which has challenged notions of an interventionist, puppeteer God, insisted on naturalism over supernaturalism, emphasized deeds over creeds, and long welcomed atheists and agnostics into our movement. This book provides a rich tapestry of visions of compassion, creativity, community, and commitment to social justice that emanate from Unitarian Universalist Humanism and enrich all of us in our living tradition. A stimulating and diverse collection of essays, this much-needed volume illustrates the wisdom, charm, passion and insight (as well as some of the frustrations and limitations) that characterize contemporary religious Humanism and have made it so controversial to its detractors and so appealing to its devotees. I came to Unitarian Universalism because of its revolutionary and heretical religious Humanist history and promise. It continues to inspire and broaden me with its affirming and generous values and message. This volume of essays reminds me that the Humanist tradition is an integral part of our Unitarian Universalist story and faith—a meaningful, enlightening, and deepening path on our diverse and shared journey. Kendyl Gibbons and William Murry—who are well known for their leadership on this path—have assembled a group of outstanding voices that reflect how and why this way of believing remains vibrant and sustaining for so many. A century ago an ideal sprouted in the rich, free soil of Unitarianism when John Dietrich first named his new “religion without God” Humanism. Dietrich dreamed of supportive communities that would encourage reflection and social engagement—“a common meeting ground for all . . . rich and poor, learned and unlearned, theist and atheist, on the single common basis of religious fellowship.” Humanist Voices in Unitarian Universalism is the most concise summary that I have seen of the continuing Humanist dream, both in its Unitarian Universalist context and in its many new varieties exploding in our increasingly secular world. Unitarian Universalist Humanism is a house with beautiful and unusual rooms. You will visit many of them on this grand tour. Perhaps you will decide to move in. Humanism (with either upper or lower case 'h"), whether labelled a philosophy, life stance, worldview, movement or religion, dates back to the ancient Greece and Rome of Epicurus and Lucretius. After lying dormant for centuries it began to reawaken following the Renaissance, the Reformation, the Enlightenment, and the development of science. The Deism of Voltaire and Paine was a sort of proto-humanism. The 19th century growth of democracy, public education, industry, and science -- aided by Darwin's breakthrough -- spurred the advances of freethought and rationalism. The Ethical Society movement took off after the Civil War and Unitarian congregations moved leftward theologically toward naturalistic Humanism. About 100 years ago some Unitarian ministers and philosophers began using the word "Humanism" to label this movement in religion, culminating in the publication in 1933 of the Humanist Manifesto. Soon after that Unitarian ministers founded the American Humanist Association, headed for several years by Rev. Edwin Wilson. Years later philosopher Paul Kurtz, the moving force behind the 1973 Humanist Manifesto II, founded the Council for Secular Humanism. By this time a majority of members of the 1000+ Unitarian Universalist (UU) congregations considered themselves Humanists. Today the largest group of humanists may be found in UU congregations, while others are in Ethical Societies, Humanistic Jewish congregations, and the two main Humanist organizations, the Council for Secular Humanism (CSH) and the American Humanist Association (AHA), plus uncountable numbers with no formal affiliation, not to mention the many overseas Humanist organizations in the International Humanist and Ethical Union, founded after World War II. 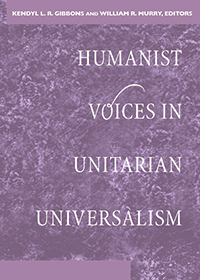 Humanist Voices in UUism highlights the diversity among UUs, among UU Humanists, and among Humanists are are not UUs. Of particular importance, the book articulates a Humanism that is positive and affirming and that emphasizes community and social justice. About half of the authors are UU ministers and half are not. Some Humanists are comfortable with the word "religion" and some are not. All, I suppose, would agree with my bumpersticker definition of Humanism as a "compassionate ethical naturalism," whether religious or secular. With the religiously unaffiliated now making up a quarter of the US population and growing, UUism needs Humanism to grow, to provide homes for these "nones" and Humanism needs organizations like UU congregations and other groups. My takeaway from this important book is that Humanists, whether UU or religious or secular, must downplay differences and, working with good people across the religious spectrum, concentrate on dealing with the all too real problems facing our nation and our world: the attacks on our public schools, reproductive choice, civil liberties, civil rights, voting rights, religious liberty, church-state separation, and anthropogenic climate change (including atmospheric CO2 buildup, environmental degradation, toxic waste accumulation, soil erosion and nutrient loss, biodiversity loss, deforestation, desertification, sea level rise, and the human overpopulation that fuels climate change). We have a lot of work to do.